WASHINGTON (AFP) – The United States wants to enlist its 3.4 million Girl Scouts in the effort to combat hurricanes, pandemics, terror attacks and other disasters. The young scouts will be able to emblazon their sashes or vests with the patch if they undergo the training which readies them for an emergency. “This new preparedness patch will increase citizen preparedness and enhance our country’s readiness for disasters,” said DHS Secretary Janet Napolitano in a statement. The move is part of a month-long government effort to make Americans better able to cope with natural and man-made disasters. Napolitano has urged individuals, families and businesses to stock fresh water and food, and prepare an emergency plan — to be enacted in the event of a disaster. The unveiling of the patch marks a partnership between the scouts and Citizen Corps, a community-based initiative under the DHS’s Federal Emergency Management Agency, which coordinates national response to disasters. The patch will be available alongside existing Girls Are Great, Girl Scouts Against Smoking, Media Know-How and Read to Lead patches, and, of course, the Cookie Sale Activity Pin. Girl Scouts sell an astonishing 200 million boxes of cookies each year on average, according to the organization, which was founded in 1912 and chartered by the US Congress in 1950. During World War II, Girl Scouts “operated bicycle courier services, invested more than 48,000 hours in Farm Aid projects, collected fat and scrap metal, and grew Victory Gardens,” according to Girl Scouts of the USA. 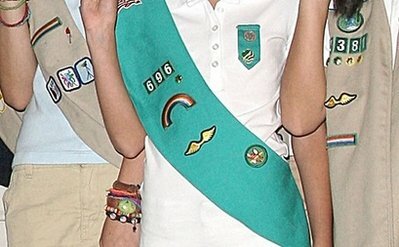 As the end of the second millennium neared and computers around the world were expected to be stricken with a debilitating bug, Girl Scouts were enlisted in some parts of the country to hand out advice about the threat poised by Y2K. After the September 11, 2001 attacks scouts hosted remembrance ceremonies and wrote thank-you letters to rescuer workers.